PITTSBURGH & CHICAGO--(BUSINESS WIRE)--Nov. 20, 2018-- Thanksgiving is that time of the year when we all get our families together to give thanks for everything we have. But it is also especially hard on parents having to deal with restless kids & a big fancy meal at the dinner table. So for this Thanksgiving, Kraft is encouraging parents to bring Kraft Mac & Cheese to the table so everyone can enjoy a struggle-free celebration! Unlike other holidays, Thanksgiving can be tough on kids with expectations of sitting still, hugs from distant relatives and quirky food, like green bean casseroles, and candied yams, that is only served once a year…and oh yea, no presents.With *75% of American families claiming to have at least one picky eater at home, Kraft Mac & Cheese is one thing parents can rely on to please their picky eaters. A video showcasing KraftMac & Cheese for Thanksgiving is available on YouTube.com: https://youtu.be/RWj0vA_ivG0. KraftMac & Cheese products are available at retailers nationwide starting with a suggested retail price of $.99. Contact your nearest store for availability. 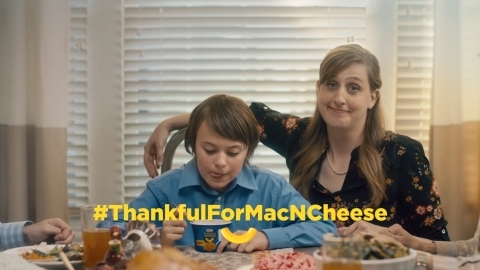 Share your thanks for Kraft Mac & Cheese using #ThankfulForMacNCheese on Twitter @kraftmacncheese, Instagram @Kraft_MacandCheese, and Facebook@KraftMacaroniandCheese. *Source: Study completed by Kraft Heinz Company; online quantitative research, fielded between Nov 10-11, 2018 with 623 households of parents with kids 2-12 years old; nationally representative).